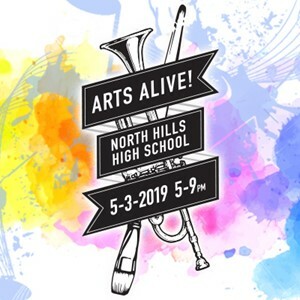 North Hills School District will host the 47th annual Arts Alive on May 3 from 5 to 9 p.m. at North Hills High School. The annual event celebrates the creative accomplishments of students in kindergarten through high school. Arts Alive is free and open to the community. The North Hills tradition features student work from a variety of mediums such as pottery, paintings, drawings, sculpture, photographs, school publications and writing projects as well as student work from the family and consumer science and technology education departments and performances from the music department. North Hills Game Fest showcasing board games and video games created by district students in Room G13. An array of culinary options from the World Language Department. Bring your family and enjoy dinner. Coffee Buddha will offer coffee, espresso beverages and hot cocoa from 5 to 7 p.m. in the high school lobby in exchange for a donation to the district’s Art Department. An art gallery opening-style event in the high school rotunda with pottery, photography and film demonstrations. Artwork, including pottery pieces and photography, will be available for purchase. Various large-scale wood and metal-working projects in the technology education department.